Welcome to my workshop / course section of the site. Four years ago I stepped in the field of teaching people the art of landscape photography since then I have had the pleasure of teaching over 500 students. My courses cater for the real beginner to the advanced / professional photographer. You will be taught my full image capture workflow, setting up compositions and the thinking behind making an image work along with discussion on printing your work, colour management and much more, nothing is left out and no topic is off limits. Taking photos like mine is a reality, you just got to know how. I offer a range of different courses from fixed date group workshops to private one on one tuition. I also offer online live training for those who can't make it to NSW but want to get the benifits of my capture workflow and image editing techniques. I am proud to say that I have the biggest range of professional quality photographic courses available in and around Sydney for photographers of all skill levels from total beginers to professionals wanting to kick start their knowledge and skill in the field of landscape photography. There are times when out teaching that using visual aids speak a thousand words. Using the new apple iPad delivers a whole new learning experience as images and video content are delivered showing students how images have been shot and put together for a certain look. Shooting techniques integrated with photoshop editing can now be seen illustrating the whole workflow from capture to editing. It is an amazing new feature thats students love. All courses come with student access or 12 months membership to our world first image editing website dedicated to landscape photographers. In August 2011 I ran my Blue Mountains Day Course and had the privilege of Mike Gebicki as a student. Mikes a free lance journalist for the Sydney Morning Herald and was writing an article on photo courses to do in NSW. The detailed article talks about Mike's experience on my course. So have a read of the article if you are wondering what my courses are all about. 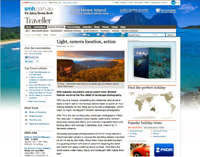 :: Click here to read the article on the SMH web site. For that personal guidance where we can start the course at your skill level and go from there. Perfect for beginners looking for that comfortable pace or professional looking to take their shooting skills to a refined level. :: Read more and book. Lets explore Sydneys circular quay and surrounding area. Shoot the Opera House, Harbour Bridge like you have never before. Unique compositions and wonderful views over our city from it's many advantage points. So much to choose in just one day. Run in and around the beautiful Manly Beach this course will take us to wide open looks outs over the beach to finding unique compositions in the ocean baths, the calm waters of Manly Cove and also Shelley Beach. Lots to shoot and lots to teach. Set along the sandstone coastline of the Central Coast this course will have no shortage of great beaches to pick from to put your new skills into pratice. This course is at a special price due to being held locally for me. The world heritage Blue Mountains awaits us as we stand along it's many lookouts and venture under the canopy creating sureal images on the cascading waterfalls that populate the area. After a full day we settle down and capture the warm light over the Three Sisters. A place that isnt just my home but a unique coastline peppered with stunning natural and man made structures. These private courses are available midweek or weekend for fantastic prices for those happy to venture to the area.